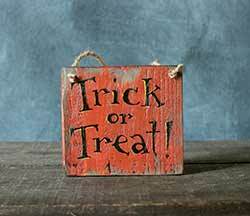 Greet autumn guests with this hand lettered rustic wood sign! 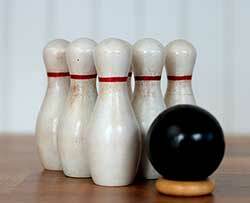 The neutral but striking dark stain and bright white color blends with most any decorating style. 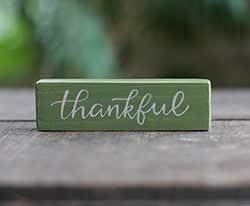 Our mini stick shelf sitters are great for adding a little charm to just about any room in your house - decorate your office desk at work, kitchen windowsill, craft room, mantel, or give as a small gift! 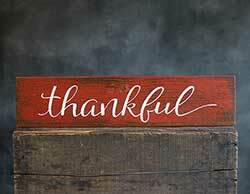 This one reads, simply: "Thankful." 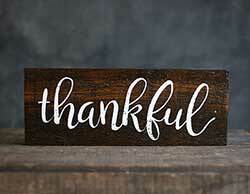 Perfect for a desk, shelf, or wall, this small sign will add a touch of fall to your home or office, a great reminder for the season of giving! 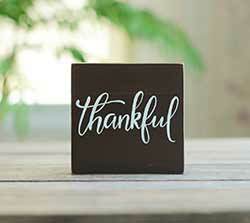 Perfect for a rustic look, this Thankful sign will add warmth to your home, either for everyday or fall decor! 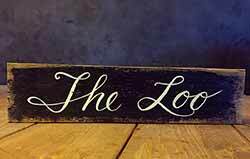 Add a unique vintage look to your bath or powder room with this hand lettered, distressed wood The Loo sign! 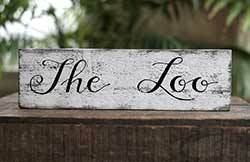 The Loo Wooden Sign, by Our Backyard Studio in Mill Creek, WA. 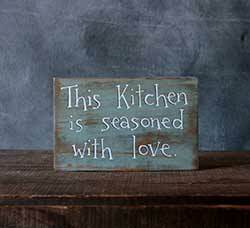 Add the look of old fashioned, hand lettered charm with this rustic, reclaimed wood sign! Thou Shalt Not Whine Wooden Sign, by Our Backyard Studios in Mill Creek, WA. 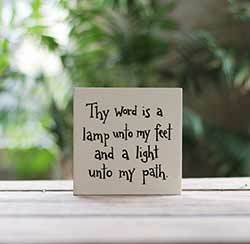 A wonderful, humorous reminder to the whole family, this rustic "Thou Shalt Not Whine" wood sign features free-hand lettering in ivory against a black background. 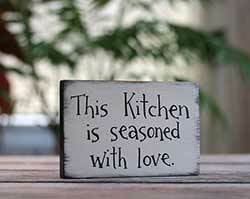 No stencils, no vinyl, no transfers were used on this sign - it was painted completely free-hand. 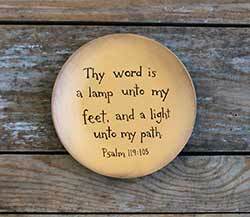 Sanded, stained, and antiqued for a purposely weathered and rustic look - knots and nicks of the pine wood are visible. 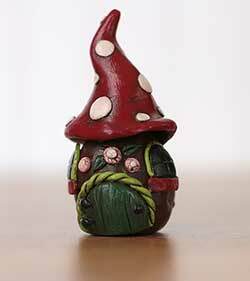 Toadstool Fairy House Miniature, handmade in Washington State! Perfect for fairy gardens, dollhouse decor, curio cabinets, or shelf displays. 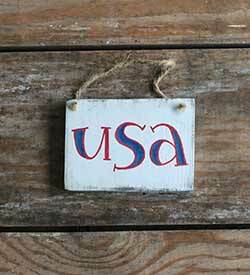 One-of-a-kind original art, made in the USA, created from our imagination without the use of molds or patterns. 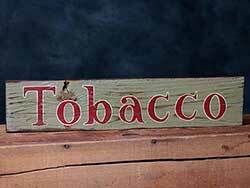 Tobacco Hand-Lettered Wooden Sign, by Our Backyard Studio in Mill Creek, WA. 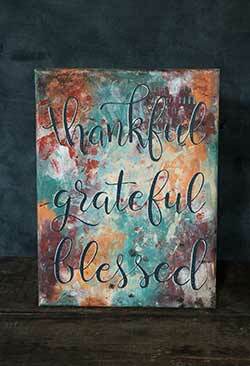 Painted on an old scrap piece of reclaimed fence board, this rustic wood sign features free-hand lettering in red against a very rustic muted green background, to resemble a vintage advertising sign. Letters are outlined in cream, shadowed in brown, and background has been sanded back and stained. 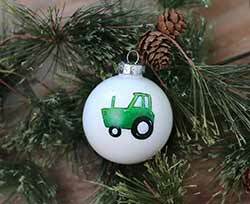 Great as a children's ornament, or gift for a farmer, this hand painted tractor ornament comes gift boxed, with free personalization! 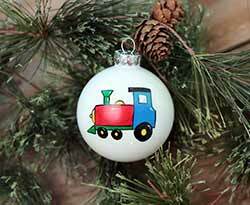 Great as a children's ornament, or for a traditional Christmas decor, this hand painted train ornament comes gift boxed, with free personalization! I love an old fashioned Christmas, most especially traditional toys like a vintage looking train! What kiddo doesn't love a train? 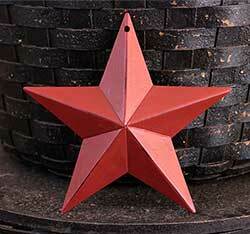 Great ornament for children, a train enthusiast, or accent for a traditional Christmas tree! 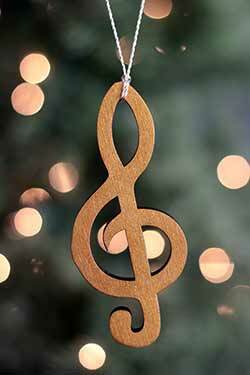 This hand painted wood treble clef ornament is a unique gift for the musician in your life! 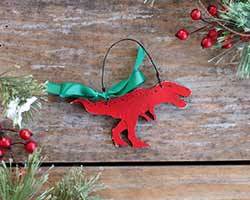 Great for a gold-themed Christmas tree, corporate or group gift, tied to gift package, etc. 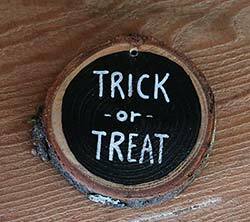 Trick or Treat Hand-painted Wood Slice Ornament, by Our Backyard Studios in Mill Creek, WA. 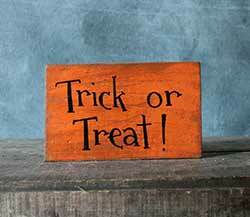 Features "Trick or Treat" lettering in white against a black background. 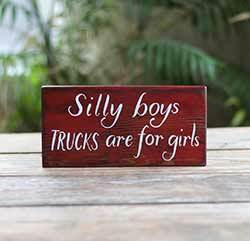 A great gift for a truck-driving girlfriend, this rustic wood sign reads: "Silly boys, trucks are for girls." Available in red or white. 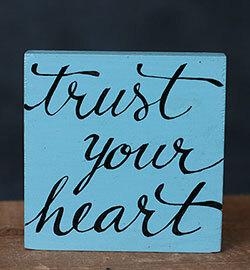 Trust in the Lord Hand-Lettered Wood Slice Ornament, by Our Backyard Studios in Mill Creek, WA. 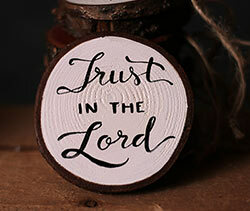 Reads: "Trust in the Lord" in black hand-lettering against cream background. The perfect gift for the turtle lover in your life! 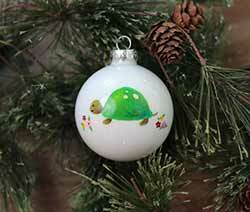 This hand painted glass ornament comes gift boxed, with free personalization! 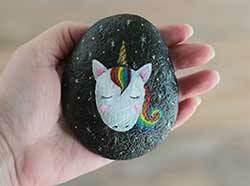 Features a magical white unicorn, with golden horn and rainbow mane. Background is black with tiny stars. 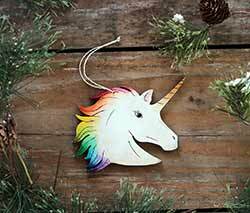 Rainbow Unicorn Ornament - Who can't use a little myth and magic to brighten their day? This one is painted with pretty pink and gold! 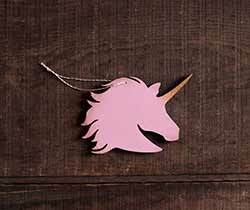 Who can't use a little myth and magic to brighten their day? 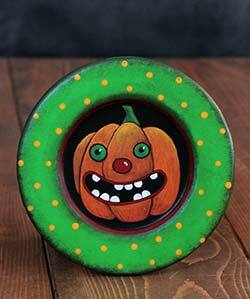 This one is painted with rainbow colors! 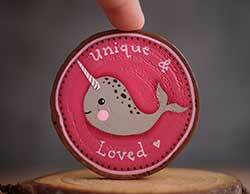 Perfect for that unique, one of a kind special person in your life, this hand painted narwhal ornament comes with free personalization! 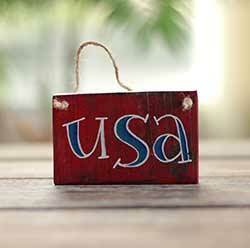 Display your patriotic spirit with this little wooden sign ornament, perfect for displaying on a knob or pull, small wall space, tree, or in the center of a wreath. 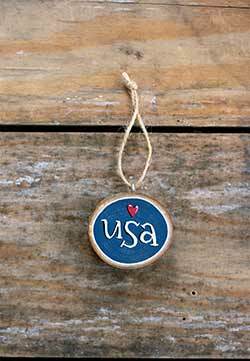 Add a spot of patriotic charm to your home or office with this small USA ornament, perfect for displaying on a knob or pull, small wall space, tree, or in the center of a wreath. 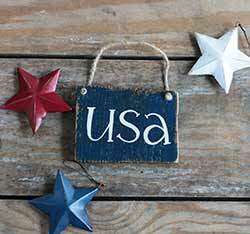 This hand painted ornament is perfect for a patriotic Christmas tree, 4th of July decor, or a gift for a serviceman or servicewoman! Comes with free personalization. 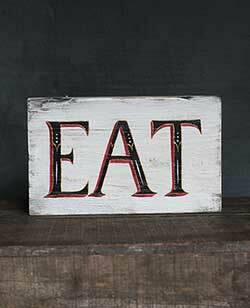 Add a vintage vibe to your kitchen or dining area with this distressed wood "eat" sign, hand lettered the old fashioned way, inspired by antique signage!